Social movement Engage for Success promotes engagement in the workplace as a way of benefitting individuals, teams and entire organisations. Here, executive director Cathy Brown tells us some of the challenges to having a fully engaged workforce and how Engage for Success is making a difference. There’s a prevailing attitude that engagement is something you do to people. That’s wrong. It’s an environment you create. What is Engage For Success and how was it formed? It was set up in 2008 on the back of a report to government [The MacLeod Report] by our founders, David MacLeod and Nita Clarke. They established that engagement was a real and tangible thing that makes a difference to individuals – and therefore organisations and therefore the economy. They wanted to create a social movement for people who are passionate about making workplaces better for the people who work in them. They gathered together a taskforce to raise awareness of employee engagement and shine a light on the benefits. Most people from the organisations we speak to nod their heads and say, yes, they do want that, but don’t know how to change behaviour and management cultures. That’s where we come in. How does a voluntary movement operate? How many permanent employees do you have? In terms of permanent employees, it’s just me. I am the team. I was appointed two years ago, though had previously been a secondee while I was working for BT. By the time it was decided that someone was needed permanently, I had left BT so I went through the selection process and was delighted to be offered the role. I operate with a fluid, fluctuating team. People opt in and out, giving what they can, when they can. I have a core team of up to 12 people – we’re quite large at the moment. And we find that people who work with us on secondment don’t want to leave when they go back to their organisations. They still get involved in hefty ways, because they are passionate. We run on the energy of our volunteers. How is Engage for Success evolving? We would like to spread our focus beyond the leadership organisation and get more into grass roots, and explore the bottom-up demands. Also, we’re being more visible in terms of responding to government papers, such as the recent Building our Industrial Strategy green paper. It’s something we’ve always done informally, but we want to be more involved in a formal way. What are the barriers you face in achieving your objectives? There’s a barrier against anything in comms and engagement if the organisation as a whole doesn’t value those areas as they should. Leaders often say, “We’re just going to talk to people, we don’t need communications.” There’s a prevailing attitude that engagement is something you do to people. That’s wrong. It’s an environment you create. And employee voice is often not recognised. An employee should feel strong and safe enough to give their view and to challenge, or say a process doesn’t work. And that should be welcomed. Leaders and managers need to look at how they facilitate two-way conversation. The Engage for Success and IoIC websites have a huge amount of credible resources for people who want to make changes and find better ways of working. Aside from communicators and HR teams, who else needs to be involved in the engagement process? For me, the line manager is the most important role in the whole of the engagement structure. Your line manager is the person your employees engage with on a day-to-day basis. One of the key enablers to engagement is the strategic narrative of an organisation – its meaning and purpose, where the business is going and where you fit in it as an employee. If line managers don’t understand that for themselves, it’s virtually impossible for them to communicate it to their teams. What are some of Engage for Success’s key activities? We do a lot of crowd-based research with our experts. Our taskforce is switched on and will tell us what’s on their minds. We distill what’s bubbling up. We have a group we call wicked thinkers, who are daring and even disruptive in their attitudes and prepared to reinvent their environment and values. Once or twice a year we get some of them together with futurist thinkers and record their conversation for a podcast. It’s a good way to identify what is coming down the track. For example, they’ve recently discussed how education is not supporting the world of work. We’re not teaching students about people-centric management. So can we create a sea change and influence curricula – A levels, MBAs, business studies – to be more engaging and about techniques that are important to be a good leader? And in June, we’ll publish findings of our research with Ashridge, where we’ve looked at the barriers to engagement at team level. Where two teams are equal in every respect, in terms of being at the same divisional level of an organisation, what makes one perform better than the other? The early insights are very interesting. You’ve recently published a toolkit for the not-for-profit sector. What have you discovered through that work? That group is chaired by Martyn Dicker, the human resources director for The Prince’s Trust. A culmination of three years’ work has produced this toolkit for engagement challenges in the third sector – though it applies beyond this group. In the not-for-profit sector, people tend to get engaged with the cause, rather than the company or the task. And in a volunteer workforce, you have to look out for burnout because people get attached to the cause. They don’t have normal day-job switch off. We’re launching the toolkit on 4 April, and we still have spaces left for the launch event if anyone is interested in attending. The engagement survey is also a focus area for you, isn’t it? What trends do you see on the horizon? Brexit. More specifically, the massive uncertainty caused by Brexit. You need to have a plan to communicate. People aren’t talking about it or planning around it enough. Employers need to remember that they still need to communicate in the absence of nothing. 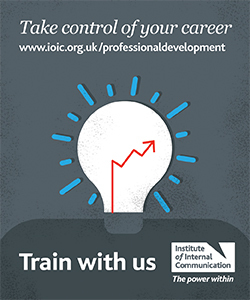 Why is the partnership with IoIC exciting for you? Engagement and internal communication are complementary disciplines. You’ll often find engagement and IC in a business can sit together or are very closely related. The skill set for internal comms is pertinent to the engagement agenda. There’s a lot that can be shared between the two teams in terms of knowledge and networks, so this new relationship with IoIC will be beneficial to both of us. It is fantastic that IoIC is represented on our taskforce and to get valuable information on trends in internal comms. In our meetings, we always have an expert speaker and we give an update on the progress of Engage for Success’s strategy, but the most important part is getting members’ input to steer the future direction of the movement. Do you have any research identifying client financial improvement as a result of your efforts? Seems no one in the field talks about results, I'm curious why that is. To leave a comment on this article, please complete the form below. Your comment will be posted once verified by our editorial team. If you are not an IoIC member and would like to join to receive Voice and other membership benefits, visit our Membership page. ARE YOU ON A ROAD TO NOWHERE? Copyright © 2019. The Institute of Internal Communication. Thanks for staying with us! Please fill out the form below and our staff will be in contact with your shortly. The see all of our room options please visit the link below.